Google Labs added a new experimental service: In Quotes, which compares what different politicians say about popular issues like health care, taxes, environment. 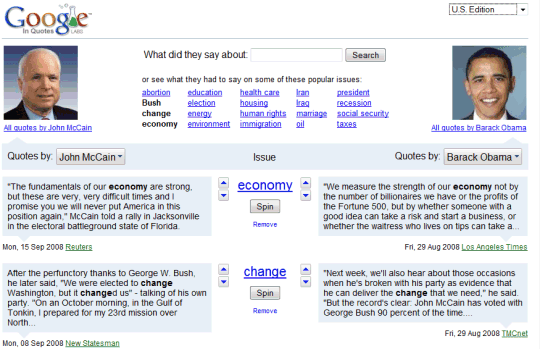 The service uses a feature from Google News that detects quotes in news articles and a public API that offers programmatic access to the quotes. "These quotations are a valuable resource for understanding where people in the news stand on various issues. Much of the published reporting about people is based on the interpretation of a journalist. Direct quotes, on the other hand, are concrete units of information that describe how newsmakers represent themselves. Google News compiles these quotations from online news stories and sorts them into browsable groups based on who is being quoted," informs the FAQ. Automatically detecting quotes is not an easy task, so not all the quotes are correctly attributed. Google truncates long quotes because they're treated the same as search results snippets. For now, Google selected a small number of political figures from the US, Canada, India and the UK, but it would be interesting to create a service that allows users to enter two or more names and then save the interesting quotes. Yet another reason why Google is amazing. Hmm.. Anyone else see an uncanny resemblance?